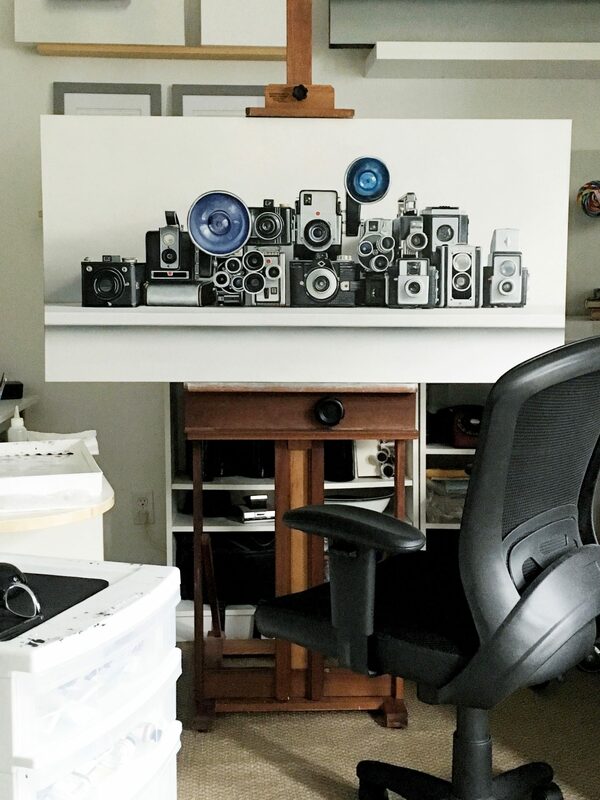 I shared an image of this painting in the final stages on the easel, and here it is complete — shown with some of the cameras I’ve collected so you can get a better idea of the scale of the painting. This is a companion painting to the clocks that I recently painted. The objects are all functional, they serve a purpose and all fit in the hand. They are painted slightly larger than life-size. The canvases are twice as wide as they are high — they make you look left to right and I deliberately composed them to form an arch — the images below demonstrate what I’m trying to get across. The myriad of repetitive circles — the lenses and flashes of the cameras, the faces of the clocks also move your eye along and across the surface of the painting. The details hopefully pull you in. These objects all serve the same purpose, but they have subtle differences that make each one unique. My goal was to take this very simple compositional style — an object shown straight forward on a white shelf — and transform it into a rather complex scene of minute detail. Both of these paintings have already been claimed by collectors — I hope they make them happy for decades to come. The one overarching theme that is consistent in my paintings is time. The passage of time, a subtle sense of nostalgia, perhaps the dread of time moving too fast, or moving too slow. I’m showing the painting here along with some of the clocks I have collected not to be cheeky about the achievement, but rather to give a sense of scale. The painting is four feet across, the clocks are just a bit larger than life-size. 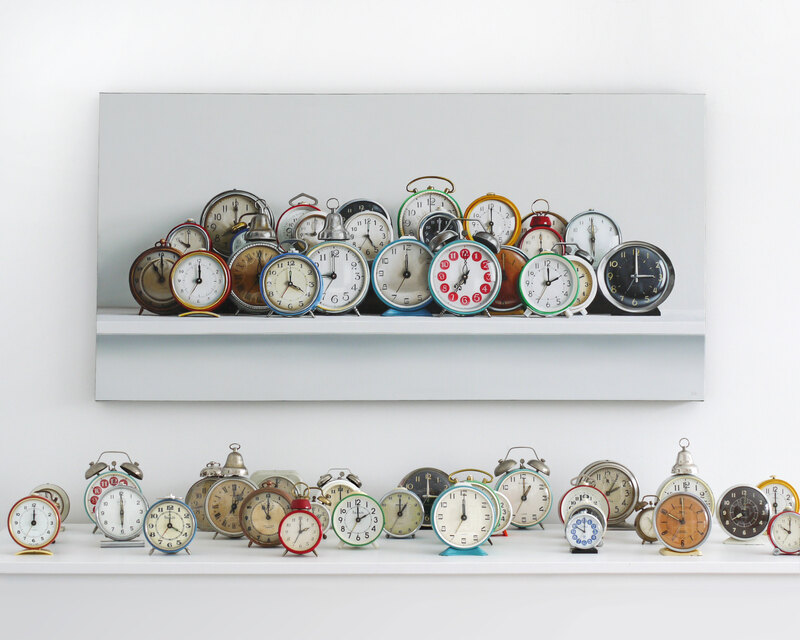 I have painted groupings of clocks before, but true to the theme of time in my work, the more time I spend painting, the closer I get to what I am trying to achieve. The process moves at a glacial pace. With each painting, with each passing year, I move toward a goal in the distance. The goal of a unique painting style and technique married to a solid and cohesive theme. 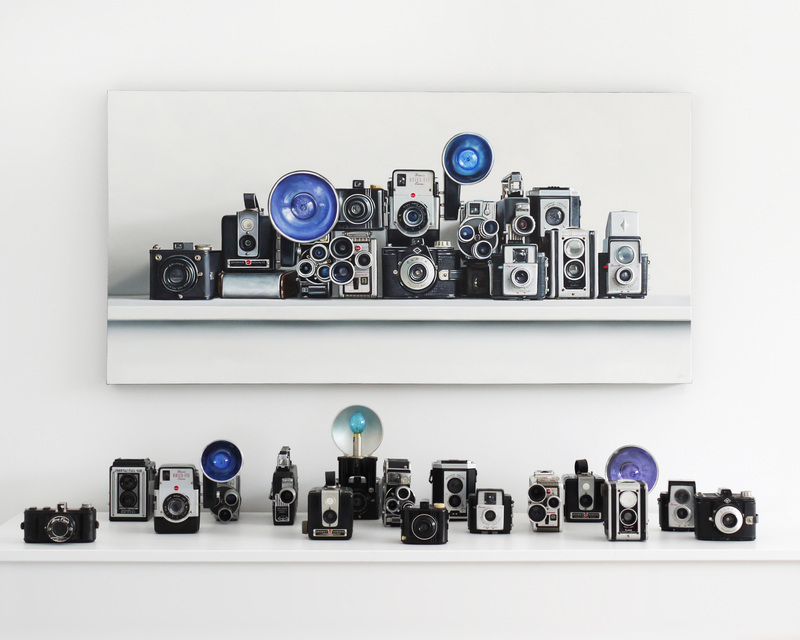 I was once asked why I paint realism, why I paint objects to look just as they are, and why I would not take photographs instead. The answer is simple – because painting is transformative. Now, I do not want to come across as someone who is anti-photography or a Luddite, in fact, I enjoy cameras and tech (see my other painting subjects for reference). But the thing is when you depict these objects in paint with a centuries-old painting process, the viewer will look at them differently. They’ll slow down and look closer. They’ll think about what it is they are seeing, they’ll connect what they see to their own ideas. At least that is what I hope they do. 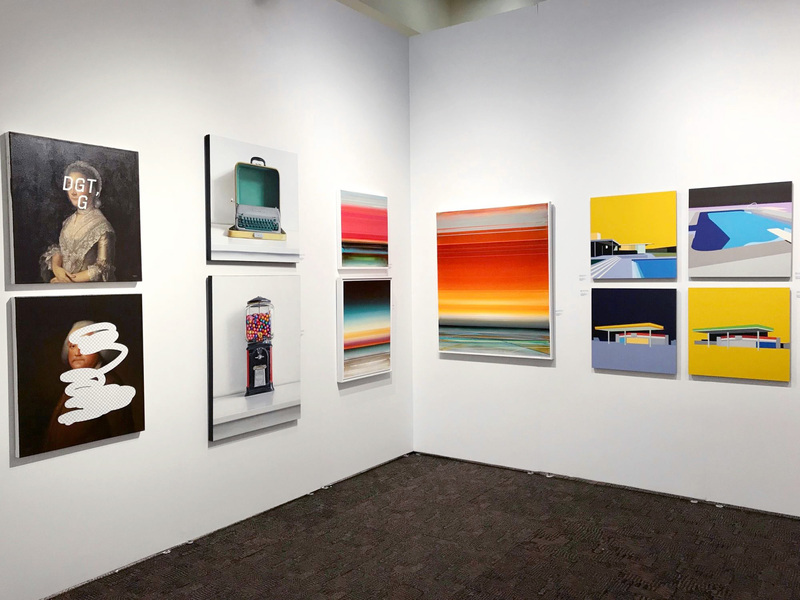 The George Billis Gallery has some of my work showing at the Art Palm Springs fair. The fair is on from February 15 to 18. It’s always nice to see my work grouped with other artists from the gallery. And there, just like that the final touch and this one is done. Now it will dry, then a coat of varnish to make the colors pop before it’s off to New York to debut on the gallery wall under a well placed light. I have been keeping a journal for 26 years. Something I notice when I read back to see what was going on in my life, say 10 years ago, is that there’s a definite cycle, a pattern of behaviours and moods. February always stands out. 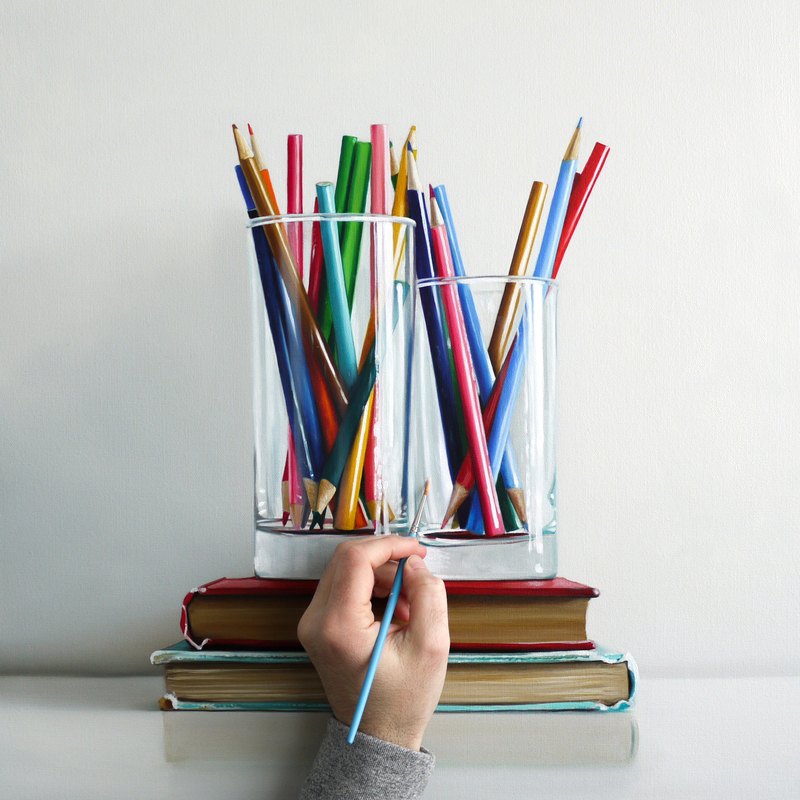 There is a way for me to combat the February doldrums — by occupying myself with deadlines. So for the last several months, I have been working toward a late March exhibition in New York. Too occupied to fuss around on social media. And that is a good thing. I have begun working on the last two paintings for the exhibition and it feels good. Once they are complete, I move into packing and shipping. The shipping part is the most anxiety-riddled process as I hand over my life’s work to companies whom I trust to get everything across the continent intact and on time.